0.25 ACRES - 8 Bedroom Luxury Home With Amazing Manuel Antonio Park Ocean Views!!! 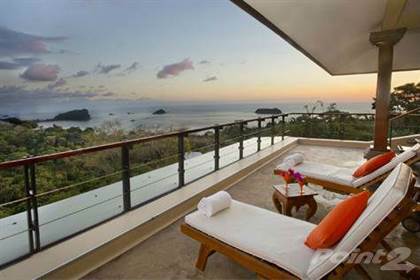 Description for 0.25 ACRES - 8 Bedroom Luxury Home With Amazing Manuel Antonio Park Ocean Views!!! Nestled amidst the unparalleled natural beauty of the rainforest, this masterfully crafted luxury villa overlooks the Manuel Antonio National Park and Pacific Ocean. According to Forbes Magazine, Manuel Antonio is among the 15 most beautiful parks on the planet and the destination continues to gain accolades on a national and international level for its beauty, charm, infrastructure and the experiences it offers its residents and guests.\r\rVilla Perezoso, a magnificent multi level estate has been featured in architectural magazines Su Casa and Ocean Home, is built into a tropical hillside providing a setting which is both exotic and natural in feel, yet just steps from all of the amenities, services and activities of the Manuel Antonio area. The villa is impeccably equipped and offers a total of 8 bedrooms, 10 full bathrooms, plus two half baths, 4 gourmet kitchens, a jacuzzi, swimming pool, multiple terraces and living spaces making it an ideal spot for groups or families who want to share space, but also retain privacy and serenity in individual levels or settings. There are jaw dropping views from every level of the home and the location on the hillside creates a unique combination of dramatic views, but a canopy level setting where the local wildlife thrives literally at your fingertips each day. The main rental villa totals 6,000 sq. feet, but there is also a caretakers unit and service quarters for full time staff, as well as a luxurious 2 level owners apartment. The Modern Balinese style and decor creates a space filled with serenity and luxury and has made this the top rated vacation home with staff in the Manuel Antonio area. Ideal for a private retreat or lucrative rental property, this is a home which stands out amongst all others in the area. Hi, I'd like to find out more information about 0.25 ACRES - 8 Bedroom Luxury Home With Amazing Manuel Antonio Park Ocean Views!!!. Thanks so much!